It looks like Nendoroid Kousaka Kirino and Kuroneko would get a new companion soon, in the form of Nendoroid Aragaki Ayase. Yep, the (good?) friend of Kirino in Ore no Imouto ga Konna ni Kawaii Wake ga Nai (a.k.a OreImo) was previously seen as a mere design in the WonFes, and now she has been displayed in fully-colored fashion! 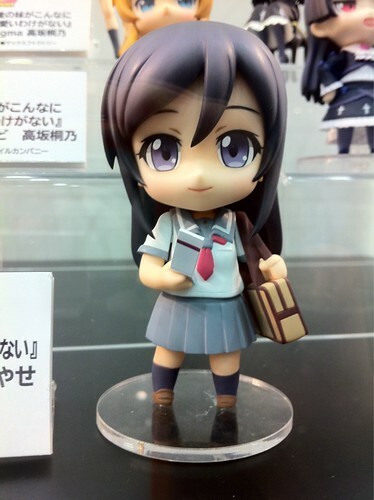 This entry was posted in News and tagged aragaki ayase, nendoroid, ore no imouto ga konna ni kawaii wake ga nai. well, I think it will be a shame if GSC won’t give her yandere face..
It’s the only condition to get her for me : she MUST have a yandere face. I agree 100 % with you, Bro. Ayase without her Yandere face is FAIL!! Boring, boring, boring! I hate schoolgirls and she’s almost identical to that other chick. Shut up, nobody needs your hate comment here. I’m allowed to dislike something. Stop getting so defensive over a drawn character. I don’t come here hating I just hate this particular series and the mass production of schoolgirl figures. So go bugger off and hump your $90 pillow with your drawn “waifu” on it and let some of us have a mind of their own. Good day sir.